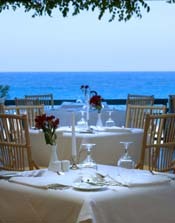 Commanding panoramic views over the emerald-blue waters of the northern Cretan coastline, the four-star IBEROSTAR Creta Marine Hotel is situated directly on three hotel owned beach bays next to the fishing village of Panormo. Conveniently located at a distance of 18 km from prefect capital Retymnon and 65 km from Iraklion International Airport, is the ideal venue for unforgettable vacations. The hotel has spacious rooms and luxurious suites, each appointed with full bath, hairdryer, telephone, Satellite TV with music channel, climate control, fridge, a safe deposit box and a private balcony or terrace, most of them allowing for a magnificent sea-view. The suites feature a cosy lounge. For exciting a-la-carte or buffet dining the hotel's restaurants serve international and Greek specialities while light meals and delicious snacks can be enjoyed at the Snack Bar. Guests can relax over cocktails or refreshments at the hotel's numerous bars or the beach bar. Fitness-minded guests will appreciate the fully equipped gym. Other amenities include a playground, a mini-club for children from 4 to 12 years, babysitting service on request, a currency exchange service, car rental, a beauty parlour and a variety of shops. 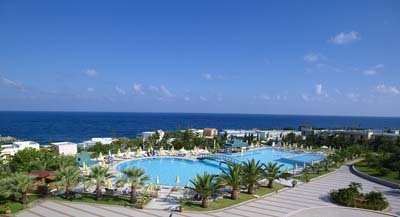 IBEROSTAR Creta Marine features two tennis courts, a volleyball court and archery, while a variety of water sports can be enjoyed nearby. For relaxation and basking in the sun there are four outdoor pools (one for children) and two "private beaches" equipped with sun umbrellas and deck-chairs, as well as a heatable indoor pool featuring a mini-Spa, with thalassotherapy, massage and Jacuzzi. A broad entertainment program is provided daily by the hotel's team of professional performers, as well as many competitions and games.